Teach your kids tidying habits that last a lifetime (and help you out at cleanup time). Some children let go of things easily, but for those who are stubborn about saving every little thing, offer up a “limiting container.” They can keep all of the keepsakes they want, as long as they fit in a certain box, or on a certain shelf. It helps to deliberately verbalize the steps of your morning and evening routines with kids. Post a checklist on a bathroom mirror or bedroom wall for things like packing lunch, gathering homework, and getting dressed. Bedtime habits are important to emphasize because they pave a smoother path to sleep. Let kids feel empowered by having them help you plan your errands before leaving the house. Have them help solve the puzzle of pinpointing the fastest route around town — and note logistical roadblocks, like making sure frozen food doesn’t melt or pets won’t be left in the car. Make it interesting with a stop for frozen yogurt as a reward. The A-B-C-D prioritization tool works for everything: An “A” toy is a favorite one that you love and play with all the time (as often as you eat or brush our teeth). “B” toys are ones you play with a lot (as often as we go to the supermarket). “C” toys are those you don’t play with very much (as often as we have a birthday or holiday). “D” toys are ones you really are not playing with at all. And D stands for “donate!” Show kids that we want to store our A and B toys where we can reach them and put them away easily, and our C toys up higher in a box or on a shelf. Just like we have a home, our stuff needs to have a home, too. Labeling containers can help kids understand where their things belong, and smaller kids can benefit from having picture labels along with words. When kids ask you to find something, point out to them that you know where it is because it has a home. That’s why we have to put things back after using them, so we can find them again! When I was growing up, I learned the Sesame Street song, “One of These Things is Not Like the Other.” Four objects were presented: Three had a common theme, and the other item did not belong. For example, three were fruit, like an apple, banana, and orange, and the other object was a pencil. By the time I finished the song, I had chosen which one didn’t belong. Look for opportunities, like this one, to teach categorizing to kids, as it is a crucial skill in sorting and organizing. Teach kids to listen to commercials and read signs with a critical eye. How is this commercial trying to trick you into wanting what they are selling? Do you really NEED to collect all four or have one in every color? Just because something is on sale, does that mean it really saves you money? 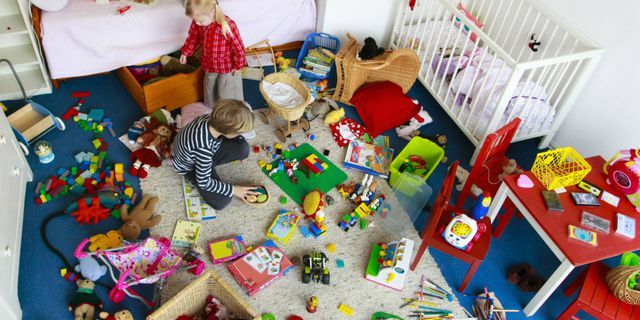 Preventing clutter is half the battle, and kids who can be discerning consumers will be smarter with their space and their money. You can make packing lists for kids when you are going on a trip, or have them help you make shopping and to-do lists. Kids love to cross things off and you’re teaching them how to organize their thoughts. Lists can also be helpful for reducing your need to nag when there are several tasks that need to be done.